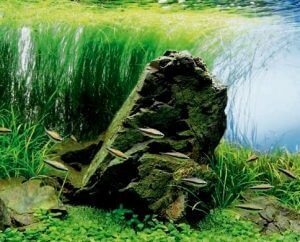 Background aquatic plants are usually stem plants that play an important role in the background of aquarium layout. 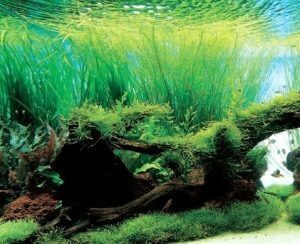 Stem plants need to be planted to ensure a good color balance so that the beautiful clump of the stem plants will stand out in the aquascape. In this article, we will discuss about some useful tips for the effective selection and planting of background stem plants. What we have to remember is that the impact of each plant varies by leaf size and color. The planting space should be determined by taking into consideration the balance of this impact. Stem plants have various leaf shapes. Large leaves give a strong impression while narrow leaves give a mild impression. 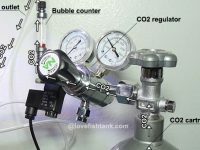 The photos and illustrations below show some examples for green stem plants. Leaf color is also a factor that influences the impact of each plant. The more red the leaf is, the stronger the impact it has. Between two leaves that have the same size, the leaf with the redder color has the stronger visual impact. Basically, stem plants that have a strong impact should be planted on the side with the heavier weight. For example, when only one species of red plant is planted in a concave composition designed at the ratio of 2:3, the red plant should be planted at the side with a heavier weight (and at the position to be determined according to the golden ratio). Particularly in the case where only a few stem plant species are used for a concave composition, you should evaluate the impact of each plant and decide which stem plant should be planted on which side. If the leaf size is the same, the impact of each stem should be arranged and distributed according to the balance of the composition. 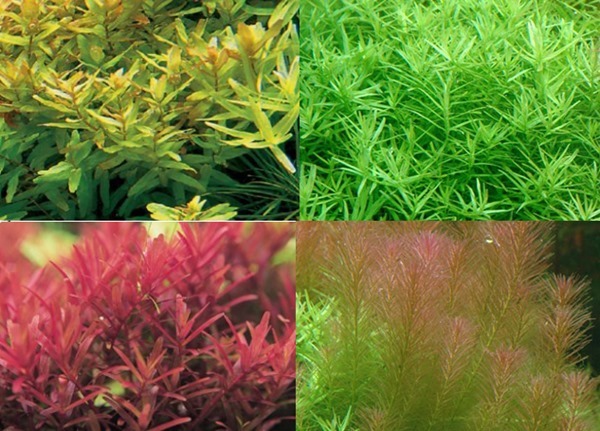 Among the various stem plants, Rotala, Ludwigia and Hygrophila are easily available in shops. Since many species of Rotala plants have a good tolerance to trimming and are suitable for planted aquarium, it is recommended for the beginner hobbyists to use Rotala as the main plant and add some Ludwigia and Hygrophila as an accent. Rotala rotundifolia (Indica), Rotala wallichii. Hygrophila difformis (Water wisteria), Hygrophila polysperma, Hygrophila stricta (Largeleaf Hygrophila). 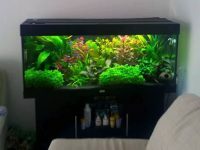 It is hard to make a well-designed layout using many different types of stem plants. If you are still a beginner, keep in mind that you should use a limited number of stem plant species, but planted in larger numbers per species. 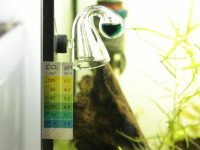 Tape-like aquatic plants are usually used in the background of the layout. The use of tape-like aquatic plants in the background has the effect of making us feel the flowing water with their over hanging leaves along the water’s surface. This type of plant also produces an atmosphere that resembles a grassy field when only a few species are planted in combination. With such features, the tape-like plants are suitable for driftwood layouts that focus on the expression of a natural ambience. Eleocharis vivipara (tall hairgrass) looks like Eleochalis acicularis (dwarf hairgrass), but it does not send out runners and grow sideways. This is a rare plant where we can adjust its leaf density and impact by reducing the volume of its long, fine leaves. 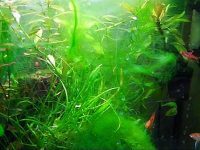 Vallisneria nana is one of the smallest members of the large Vallisneria species, which is suitable even in a 10 gallon fish tank. If it spreads its runners to an unintended location, cut off the runners to maintain the neat appearance of the layout. 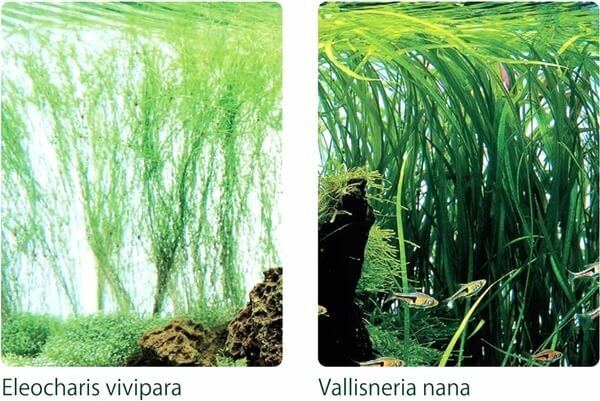 The vertical lines of Echinodorus angstiforia leaves can have a subtle variation by mixing with Vallisneria nana which has similar leaves. Regular supplementation using substrate nutrients in addition to liquid fertilizer addition is required for this plant to not suffer from fading leaf coloration. 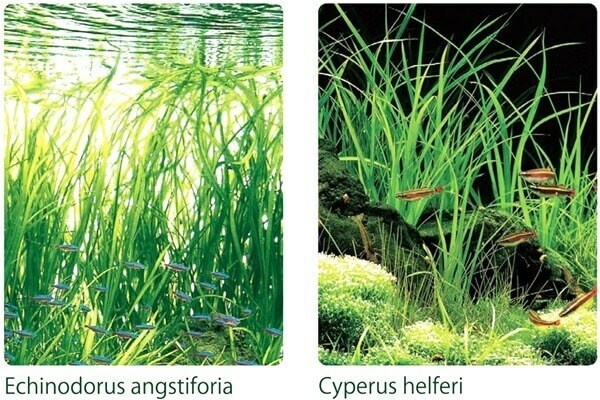 Cyperus helferi has a fresh impression like summer grass and adds a refreshing touch to the aquascape. The leaves easily overhang along the water surface. To prevent this, excessively long leaves should be cut as early as possible. Be aware of algae that may grow on the hard leaves of this plant. 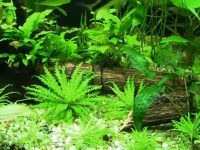 You can also choose Isoetes japonica, Crinum aquatica (narrow leaf) and Cryptocoryne retrospiralis as one of your aquarium background plants. When planting only one species of tap-like aquatic plants (single planting), the plant can be chosen according to the image of the layout. 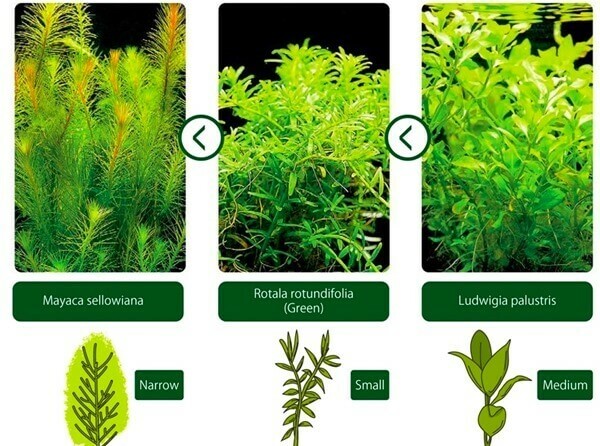 If more than one species of aquatic plants is planted (mixed planting), on the other hand, the base plant should be determined first and then mixed with other plants with different leaf widths. The choice of single or mixed planting of tape-like aquatic plant is in accordance with the intention of the layout. Planting a single species of tape-like plants is suitable when you wish to ease the impact of Oyaishi (the largest stone in an Iwagumi layout). Planting E. vivipara behind the Oyaishi has the effect of easing the impact of the stone. The planting area corresponds with the positioning of the Oyaishi. The planting of a single species of a tape-like plant tends to get monotonous. This type of plants can produce a natural feel by mixing more than one species with different leaf widths. 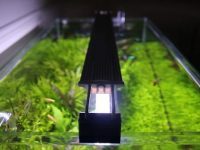 The aquascape looks attractive with a few species of tape-like plants in a driftwood layout pursuing natural ambience or in an aquascape with various types of aquatic plants. Mixing an appropriate amount of E. angstiforia among the clump of E. vivipara adds depth to the expression of the background. During the planting process, it is advised to tilt long-leaf tape-like plants against the planting direction. 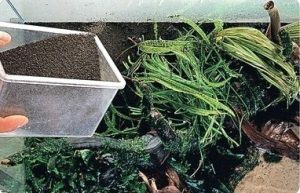 If the roots are about to come out of the substrate, some substrate soil should be sprinkled on top. E. vivipara and Cyperus helferi that do not grow sideways can be planted in their originally intended planting space in a balanced manner.